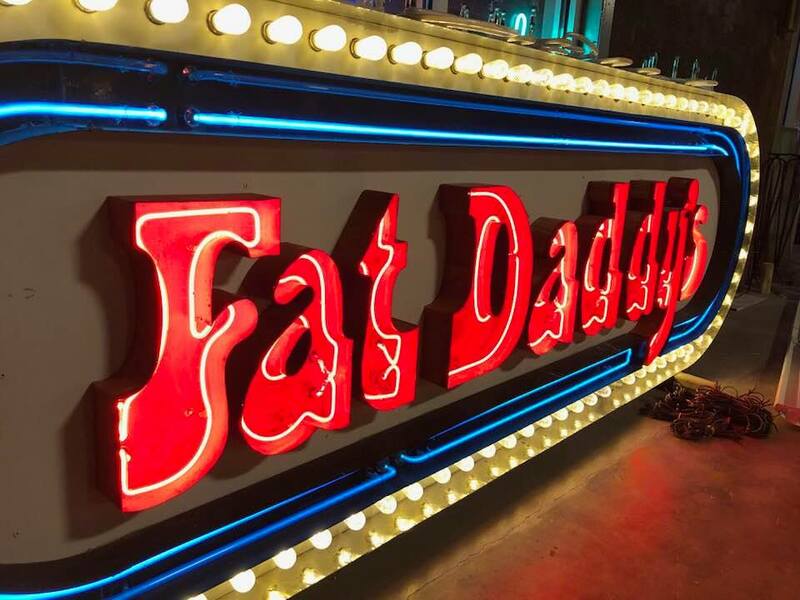 Cruising down Glenwood on a hot, summer night, the lure of the Fat Daddy's sign promised thick burgers, cold brews, and pool tables. I racked another set and frowned as some pop-jangle 2000s song came on the jukebox. Slipping in two quarters, I switched the music to Boston's "More Than a Feeling." Across the room, I heard a few people cheer as the first chords struck. We all remember Saturday nights at Fat Daddy's in Raleigh. Open from 1985 to 2014, it encompassed generations of locals. What would you say if you found out the signs from our nostalgic youth are still glowing? 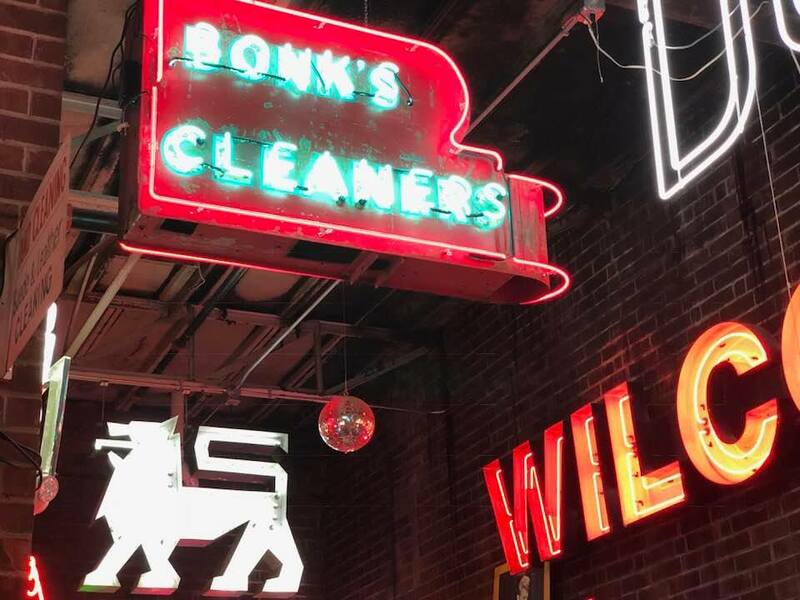 Neon artist Nate Sheaffer collects vintage and historic signage from all across North Carolina. 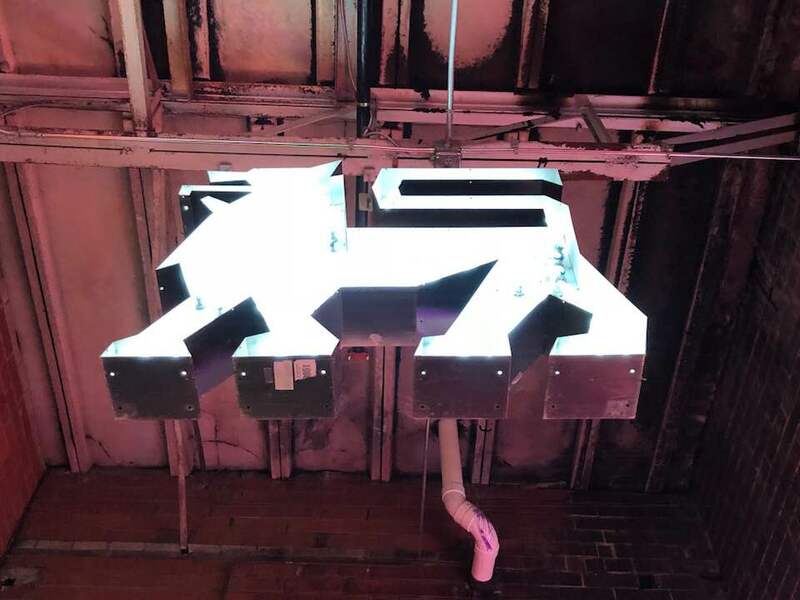 The familiar glow of the Fat Daddy's sign lights the entrance to his studio, Glas, where many of these pieces are displayed. Much like a museum, he curates and restores some incredible pieces. "It's like being a detective," shared Sheaffer's apprentice Danielle James. "We can determine what time period the signs are from based on materials, seam work, or what equipment was used to build it." "It's all crazy science," added Sheaffer. The oldest sign in Sheaffer's collection is Bonk's Cleaners, which opened in 1913. He dates the sign to be from 1927. According to Glas' social media, it's a "crusty-in-house neon restoration." 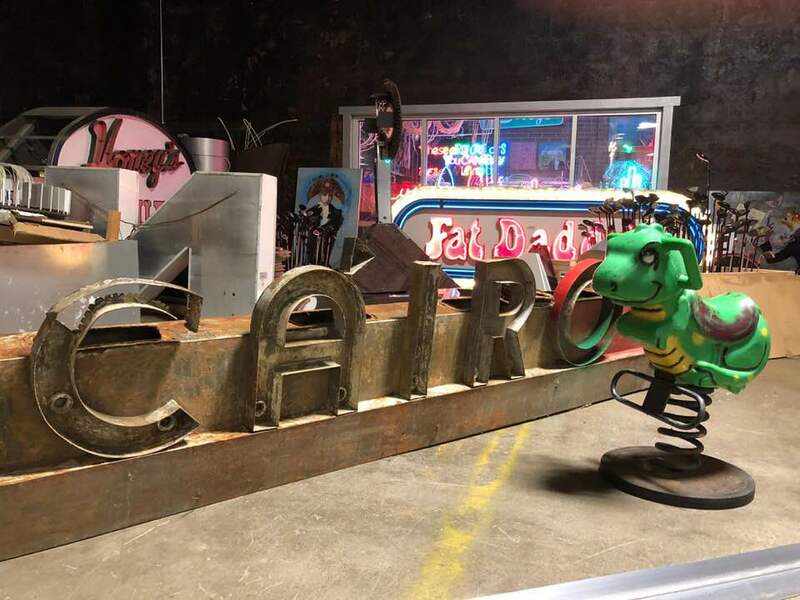 With careful work, antique signs can be brought back to life, neon pumping through their glass veins. The Cairo Drive-In was a beautiful piece of abandoned Americana. Located in the small Cairo community, situated between Fuquay-Varina and Willow Springs, this drive-in was once known as the 5 Points Drive-In. From a first glimpse, Sheaffer dates this sign to the 1940s but intends to do further investigation of its metal guts to see if he can determine a more specific time frame. All that remains of the demolished drive-in is the corroded metal outline of its sign, over 50 years old. According to Cinema Treasures, it once held a 250 car capacity. It closed in the 1970s and sat abandoned for many years, becoming a beacon for urban explorers with tree branches and overgrowth climbing its tarnished white screen and vacant dirt parking lot. Sheaffer discovered the sign on Craigslist, which he wolfishly describes as "gold for vintage advertising." The historic relic currently sits in the glimmer of Fat Daddy's red glow. "I plan to turn this piece into a marquis," he said. As a Raleigh native, born in the same year as the Fat Daddy's sign, I took an opportunity to pose beside it. Sheaffer has been hard at work securing the legacy of this sign. While the sign is nearly 36-years-old, it's being used to train the next generation of Raleigh artisans. One of Sheaffer's apprentices began practicing the craft by dissecting the sign. By splitting it in half, the double-sided sign became two complete signs, each carefully prepped for restoration. What is the fate of this iconic piece? Sheaffer intends to keep at least one of the signs to show in his gallery. 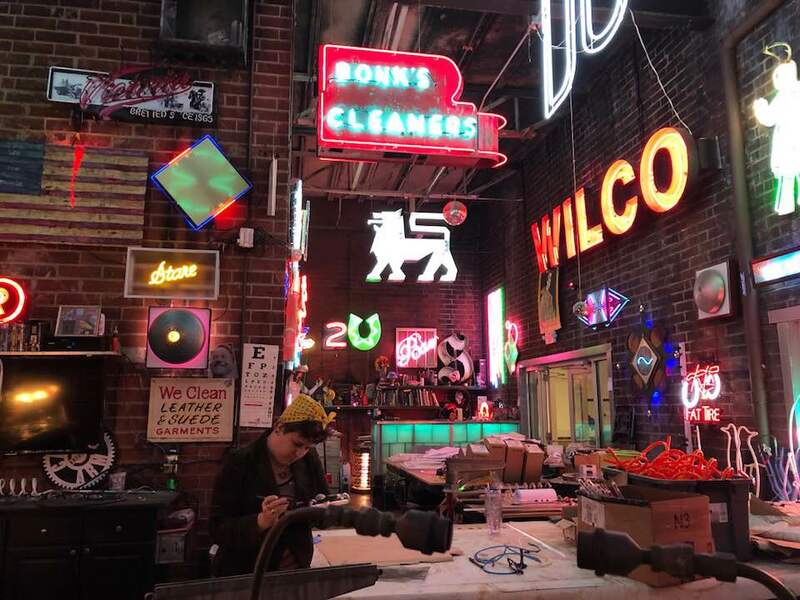 Other than the pieces he keeps in his museum, he often sells his neon work. Honey's Restaurant was a chain of sweetly beloved North Carolina-based diners that started in Charlotte. The location in Durham opened in 1961 on Guess Road off I-85. According to Open Durham, it was a "Durham Institution" with families eating Southern-style cooking for Sunday brunches. With old-timey yellow and brown retro decor, this location was the final holdout of the dying chain of diners, leaving many Triangle families wistful for simpler times, scrambled eggs, and coffee at honey's. Sheaffer said a collector has already claimed this nostalgic piece. 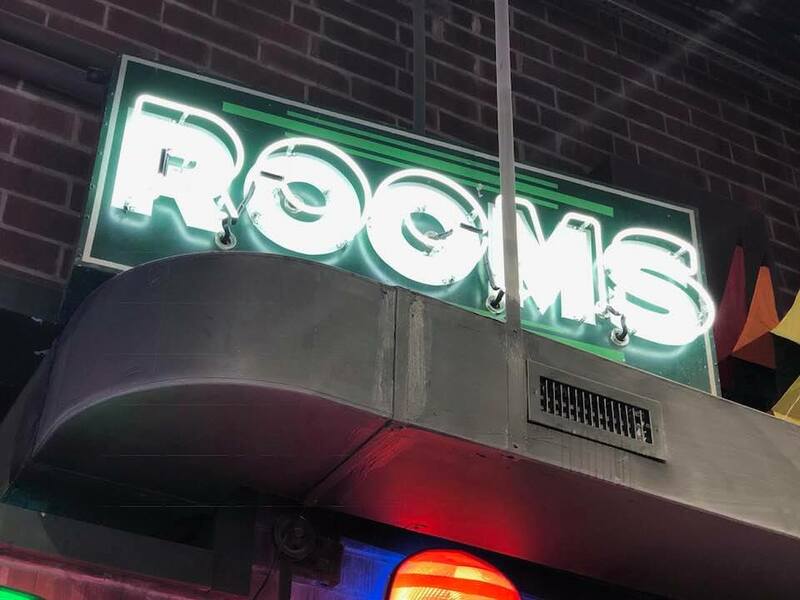 "We also have an early 1950s sign that originally lived on a house in a residential neighborhood," explained Sheaffer, showing me to a simple sign that just said, "Rooms." What was the sign's original use? Perhaps it indicated a room for rent in 1950s suburbia. While he can't always determine the purpose of a sign, Sheaffer's unique brand of detective work gives him clues to the sign's origin and age. "Based on the way the cabinet is built, we can tell what era it was built in. This particular sign has a Pittsburgh seam." "I always tell my apprentices, when it comes to neon signs and vintage roadside signs - make it right the first time, because it's going to last a long time," shared a wizened Sheaffer. Given that Sheaffer's modern and still-active pieces can still be seen all over Raleigh, it seems likely he's crafting neon nostalgia for future generations. Dozens drink morning java in the buzzing glow of his Cup-a-Joe sign. Music lovers see his Schoolkids Records fish sign when buying albums and dance beneath his neon masterpieces at the Raleigh Ritz. "It's the kind of art that lasts and lasts. You can make something that will outlive you by many years." Want to go see some neon history up close and personal? 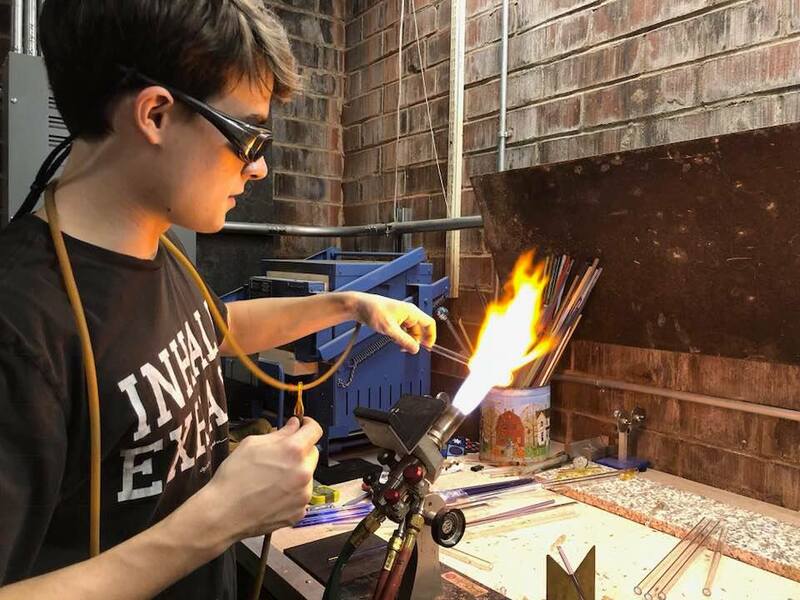 Check out Nate Sheaffer's studio Glas on Facebook or Instagram, or go visit in person! It's free and open to the public at The Loading Dock on 1053 E. Whitaker Mill Road, Suite 125.